Architects from CHANGE.NL are behind this modern wooden masterpiece located on the southern boundary of Delft in The Netherlands. This artfully constructed wooden home enjoys a wonderful location in a clearing surrounded by mature trees, and the home's exterior establishes a strong connection with the natural atmosphere of the location. With a unique winged roof offering an awning and a second floor balcony, as well as plenty of windows all around the home, this modern structure was built for enjoying the outdoors, no matter the season! Some homes have stately facades that command attention as the central focal point of the home, drawing attention with elaborate molding that clearly distinguishes the front of the home from the back. This house, in contrast, is uniform all around, emphasizing its 360-degree view of nature with a design that treats all sides equally. The architects could have included an elaborate facade, but what for? Located on its own little slice of heaven, this country home is meant to be enjoyed from all sides. In a very natural extension of the first floor ceiling, the home enjoys a wrap-around porch on the second level. 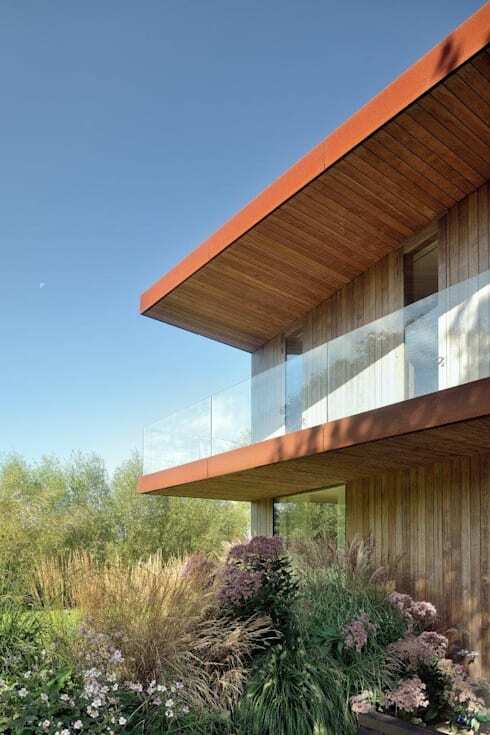 The facades are constructed from a combination of Corten steel and vertical wooden panels, and the balcony lets these beautifully varied planks show through via a transparent plexiglass railing. This natural extension of the ground floor ceiling combined with the simplicity of transparent panes makes for a look that's as luxurious as it is effortless, attaining a minimalist air that gives all the spotlight to the shrubs and prairie grass below. 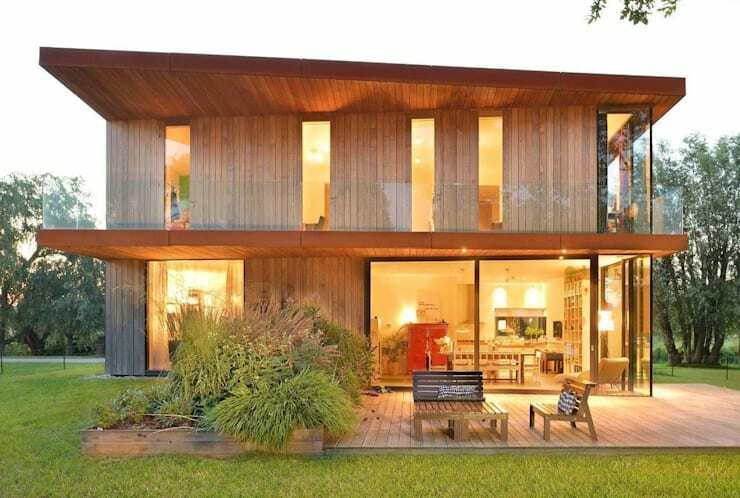 For another look at a natural, minimalist-inspired home, take a tour this wood-clad, innovative masterpiece! Everything about this balcony says family cabin , but the glass railing and floor-to-ceiling windows along the sides tell a more modern story. As familiar as it is fresh, this wrap-around porch offers plenty of floor space for a few chairs or blankets, allowing this family to enjoy the sun and fresh breeze. 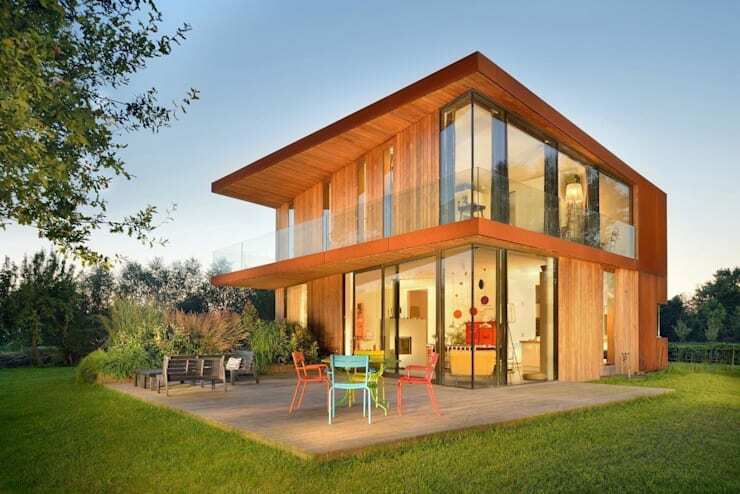 The rear part of the home's volume is two steps lower compared to the entry level, creating a sloping base upon which the compact home has been able to achieve a few extra feet of height due to the sloped ground. The master bedroom in the upper floor has a large glass window in the line of sight set on the first floor, where the living room is found. As you can see here, the south facade is made almost entirely of glass and only partially shaded by the narrower part of the balcony on the upper floor. 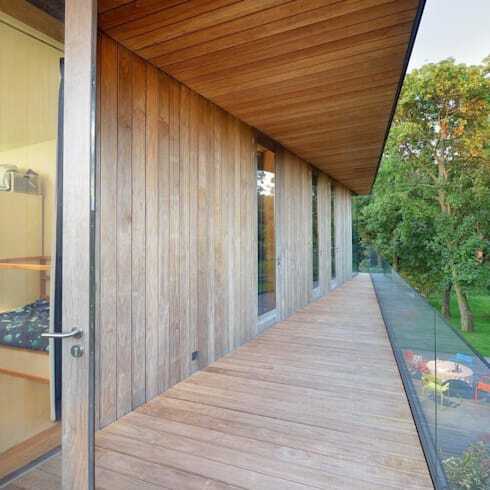 This allows plenty of natural light to fill the home. 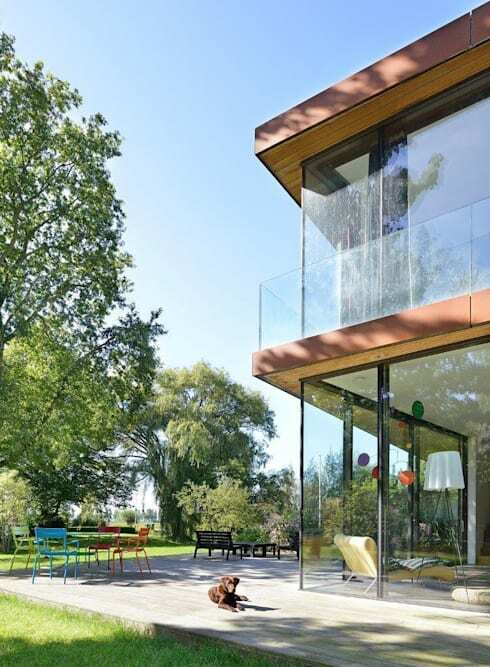 This glass wall also establishes a very strong connection with the outdoors, as the patio appears to be a continuation of the interior floors, with a seamless grey floor that appears to span the living areas both inside and out. Inside, the home adopts a white minimalist tone, but the main elements are still present in a cohesive theme – again, you'll see the same glass railings that envelop the balconies on the outside, and the same warm yellow woods that comprise the entire exterior of the home. 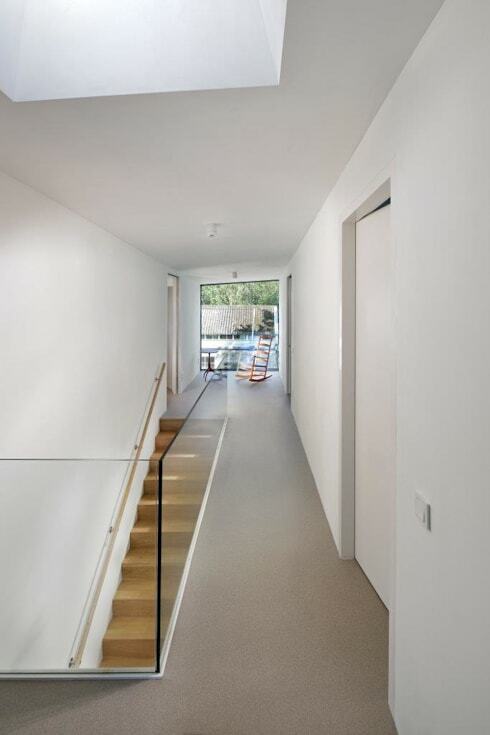 For an exceptionally well-lit staircase and hallway, the architects have placed a large window at the end of the hall, its light traveling beyond the quiet rocking chair and easily illuminating the interiors with a moderate, natural glow. What do you think of this natural family home? Comment below!